Wesham members are greatly saddened this week by the loss of former club chairman Graham Vickers who sadly passed away at the weekend aged 60 after 5 years battling throat cancer. This follows the loss of long standing member, treasurer and 10k race director Les Ward. Rob Danson scored another clear win at the penultimate fixture of the 2018 Inter Club Grand Prix in Astley Park in Chorley with a fast time of 24:43 for the hilly 4.5-mile 2 lapper. A strong duo of Steve Swarbrick and Steve Littler came in 6th and 7th in 27:50 and 28:00 respectively with David Taylor running 28:55 for 13th place. Despite this good start the Wesham Open team finished 3rd with Steve Abbott 28th (30:19); Lee Barlow 29th (30:22); Paul Hetherington 32nd (30:30); Tessa Robinson 36th (2nd woman 31:07); Andrew Harling 45th (31:34) and Jason Barlow 50th (22:00). The Wesham women finished 5th with Tessa Robinson 2nd; Helen Lawrenson 9th (92nd 34:41); Tracey Hulme 21st (144th 38:46); Maureen Danson 37th (185th 41;37); and Jo McCaffery 60th (227th 44:56). The Women W40+ were 4th with Lawrenson 4th; Hulme 9th; Danson 19th; McCaffery 34th and Pauline Eccleston 35th (230th 45:18). The Open Masters were 2nd with Swarbrick 2nd; Littler 3rd; Abbott 12th; L Barlow 13th; Hetherington 15th and Robinson 18th, while the M50s were 4th (Nigel Shepherd 10th and 72nd 33:28); John Collier 20th / 93rd 34:49; Peter Cruse 24th / 110th 35:42 and Stuart Clayton 33rd / 128th 37:15); and the M60s 2nd with Shepherd 2nd; Collier 5th; and George Kennedy 11th (134th 37:57). Overall Wesham are 2nd in the Open, W40+ and M60 team rankings, and 3rd in the overall masters, with the women and M50s 4th. Full Wesham results from Wednesday: Thomas Crabtree was 52nd in 32:16; Carl Groome 58th (32:36); Mark Renshall 60th (32:48); Leigh Doughty 61st (33:01); Matty Chamberlain 63rd (33:05); Neil Gregson 65th (33:14); Matthew Atherton 68th (33:24); Elliot Costello 98th (34:58); Paul Lancashire 103rd (34:14); Lee Nixon 113rd (35:52); Rob Wallace 122nd (36:39); Martin Allison 124th (36:46); Phil Leaver 152nd (39:13); Ryan Azzopardi 172nd (40:45); James Danson 187th (41:48); Dave Young 194th (42:14); Paul Carter 201st (42:42); Graham Cunliffe 218th (44:14); Peter Bartlett 225th (44;49); Diane Blagden 62nd and 233rd (45:33); Kerry Eccles 64th and 237th (45:50); Jonathon Sanderson 242nd (46:07); Nicola Ball 73rd and 251st (47:36); Anne Berry 83rd and 263rd (48:48); Tanya Barlow 84th and 264th (48:49); Julie Rooney 90th and 275th (50:30); James Birchall 282nd (51:52); Emma Davies 100th and 286th (52:10); Sue Rigby 109th and 298th (59:22); Antoinette Holton 110th and 299th (59:25); and Sophie Scott 111th and 300th (59:26). Rob Danson tore up the course record at the Catforth Canter 5k on Saturday evening steaming round to a win in 15:02. 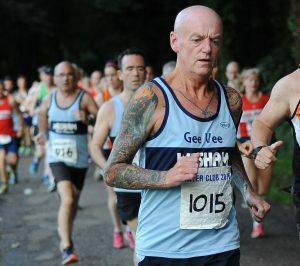 It was a Wesham club championship counter and there were many personal best performances logged Paul Hetherington finished 8th in 18:19 (2nd M45) with Lee Barlow chasing in 9th with 18:32 (3rd M45) finishing in tandem with Andrew Harling 10th with a massive improvement on his PB with 18:33. Carl Groome (4th M45) came in 16th with 20:01; Lee Nixon 21st in 20:31; Jonathan Lawson 25th in 21:52; and Ben Wrigley 33rd with 22:51. Kath Hoyer finished 7th woman and 1st W55 in 23:40 (39th overall); Sharon Cooper 9th woman, 2nd W45 and 41st in 23:53; Alan Hudson was 1st M65 in his return to racing finishing 42nd in 23:56; Maureen Danson 10th and 1st W50 (46th overall) in 24:58; Pauline Eccleston 11th and 47th with 25:10; Diane Blagden 15th and 53rd in 26:25; Gemma Owen 16th (3rd W35) and 44th with 27:15; Tanya Barlow 17th and 58th in 27:31; Julie Rooney 21st and 64th in 28:38 with James Danson 65th also 28:38. There were two new events on the local athletics circuit with the City of Preston 5- and 10-mile races on Sunday. James Mulvany scorched around the 5 Mile race finishing in 3rd place with a time of 29:36, closely followed by Steve Abbott who came in 4th in 30:15 with the pair 1st and 2nd in the M40 category. In the 10-mile race Helen Lawrenson finished 7th woman and 1st W45 in 1:14:04, 46th place overall; Paul Lancashire was 58th in 1:17:20; and Stuart Clayton 60th with 1:17:37. There were 209 in the 10-miler and the winning time was 57:57, the only runner under the hour, and 107 in the 5-miler with the fastest time 26:12 with just 3 runners inside 30 minutes. In the Lytham Hall parkrun on Saturday morning Helen Lawrenson ran 21:03 for the 2nd fastest woman with an age graded performance of 77.75% for W45. Jason Bladgen had 21:38 for M45 66.02%; Martin Allison 22:41 with an M35 grade of 58.12%; Phil Leaver 23:57 for M65 70.01%; Andrew Moore 26:39 with M55 58.16%; Diane Blagden 27:37 and W50 62.22%; Peter Rooney 27:38 with M55 57.52%; James Birchall 29:41 and 43.51%; Nicola Carter 31:12 for W35 48.08%; and Ann Knowles 35:51 for W45 46.96%. Chris Pike ran St Helens parkrun in 25:33 for M40 54.66%, his best run since 16th June. Stuart Clayton ran the Southport run in 21:43 for M50 67.92%, his second run there. The Gores travelled to the Clumber Park run in Nottinghamshire near Worksop for Vicky’s 100th different venue. Megan ran 32:48 for JW11 50.71% with Steven and Vicky in support in 32:49 and 32:50. Emma Lund was in action at the Lancaster parkrun with a time of 22:57 for W35 65.14%. Stephen Browne was left at Blackpool parkrun where he ran 22:44 for M50 65.91% while he was deserted for the 2nd running of the new Fleetwood Promenade run where Paul Freary took the course record in 17:03 on a windy day. Rob Wallace ran 22:15 for 57.98%; Dave Marsland 22:34 with M60 72.30%; Robert Brown 23:49 and M60 67.95%; George Kennedy 23:55 and M60 67.04%; Graham Cunliffe 30:26 with M60 53.61% and Lynn Brown 31:31 and W55 58.22%.